For the first time in book form, Robert Caro gives us a glimpse into his own life and work in these evocatively written, personal pieces. He describes what it was like to interview the mighty Robert Moses; what it felt like to begin discovering the extent of the political power Moses wielded; the combination of discouragement and exhilaration he felt confronting the vast holdings of the Lyndon B. Johnson Library in Austin, Texas; his encounters with witnesses, including longtime residents wrenchingly displaced by the construction of Moses' Cross-Bronx Expressway and Lady Bird Johnson acknowledging the beauty and influence of one of LBJ's mistresses. He gratefully remembers how, after years of working in solitude, he found a writers' community at the New York Public Library, and details the ways he goes about planning and composing his books. Caro recalls the moments at which he came to understand that he wanted to write not just about the men who wielded power but about the people and the politics that were shaped by that power. And he talks about the importance to him of the writing itself, of how he tries to infuse it with a sense of place and mood to bring characters and situations to life on the page. Taken together, these reminiscences--some previously published, some written expressly for this book--bring into focus the passion, the wry self-deprecation, and the integrity with which this brilliant historian has always approached his work. 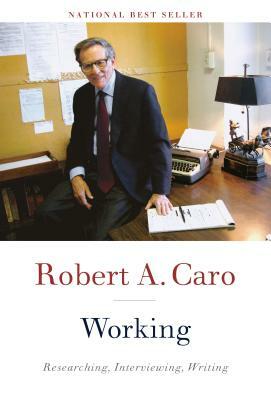 For his biographies of Robert Moses and Lyndon Johnson, ROBERT A. CARO has twice won the Pulitzer Prize, twice won the National Book Award, three times won the National Book Critics Circle Award, and has also won virtually every other major literary honor, including the Gold Medal in Biography from the American Academy of Arts and Letters and the Francis Parkman Prize. In 2010, President Barack Obama awarded Caro the National Humanities Medal. Caro graduated from Princeton, was later a Nieman Fellow at Harvard, and worked for six years as an investigative reporter for Newsday. He lives with his wife, the writer Ina Caro, in New York City, where he is at work on the fifth and final volume of The Years of Lyndon Johnson.